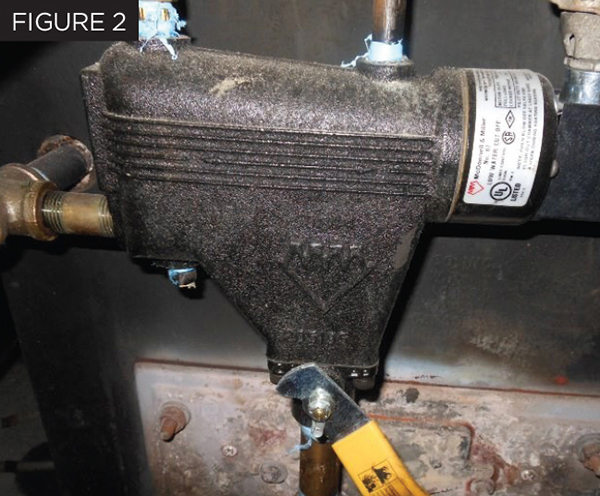 As we enter the heart of winter and turn our attention toward cold weather conditions where freezing water can wreak havoc on commercial and residential property, the threat of catastrophic failure to boilers looms large (as seen in Figure 1). 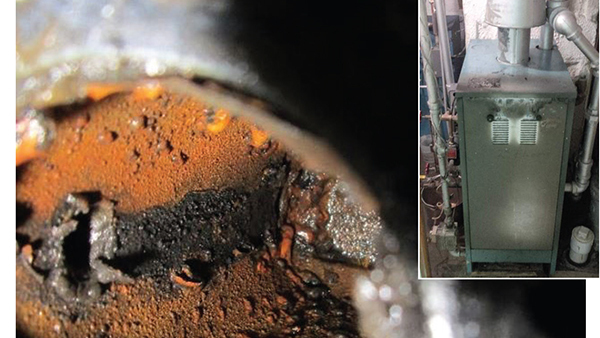 Although failsafes against significant boiler failures do exist and continue to improve, they remain far from perfect. 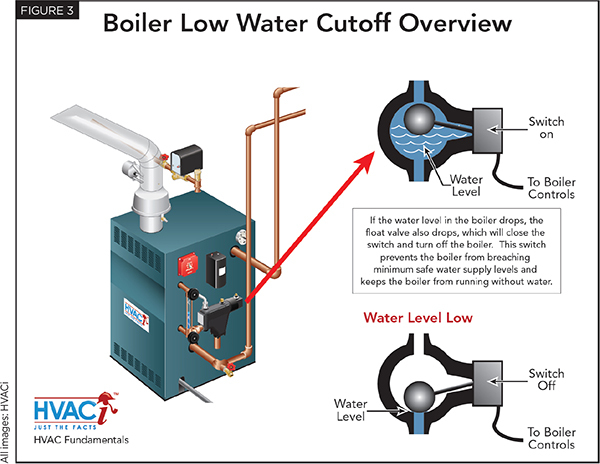 One particularly susceptible failsafe is a boiler’s low water cutoff (LWCO). An LWCO is designed to alert the boiler that it does not contain sufficient water to “fire,” and prevents the boiler’s burners from igniting until a safe water level has been restored. Because these types of failures can lead to injury or death, most state and municipality codes require the installation of low water cutoffs for both residential and commercial boiler applications. LWCOs are found in one of two designs: Electronic-probe (a more recent technological introduction) and mechanical-float (a traditional, lower-tech version, seen in Figure 2). For this article, we’ll focus our attention on the latter. Mechanical-float low water cutoffs are the most widely used water-level safety device in residential and commercial heating boiler applications. These LWCOs are simple in design and function much like fill arms found in residential toilet tanks. As the water level drops in a boiler reservoir, the buoyant arm “floats” down until it reaches a point at which the boiler is unsafe to operate, and the switch turns the heating system off as illustrated in Figure 3. Stuck valves: Mechanical-float LWCO valves are in constant contact with supply water, and are exposed to minerals, dirt, rust and other total dissolved solids (TDSs). This prolonged exposure to TDSs can interfere with the designed function of the float, preventing it from moving freely up and down in line with the actual water level. Clogged LWCOs: Sometimes, TDSs and other impurities can prevent the free-flow of water through the LWCO, and can “trick” the LWCO into reporting that an adequate supply of water is present in the boiler, when in fact the minimum safe water level has been breached. If the float is prevented from moving freely and from sending the appropriate signal to the boiler controls (and the burner) to shut down the boiler when the minimum safe water supply level has been breached, the boiler may continue to run without water (or may be allowed to start without water present). If a boiler operates without the necessary water supply, the heat generated in the boiler’s combustion chamber does not transfer to the water supply, and causes the burner, heat exchanger, and/or boiler tube(s) to overheat. 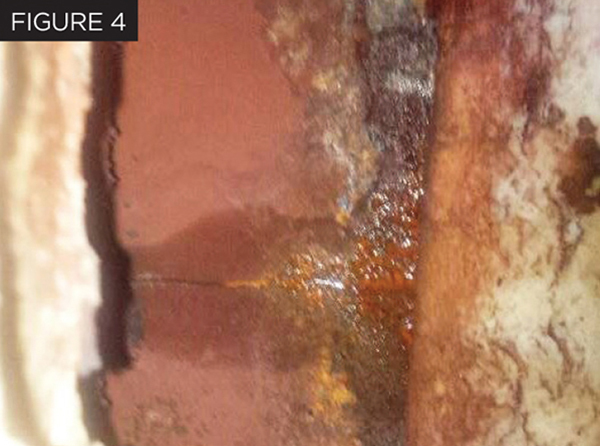 With prolonged or repeated exposure to this condition, the walls of the burner, boiler or heat exchanger may weaken and ultimately crack, as seen in Figure 4. Freezing conditions, when coupled with LWCO failure, can lead to catastrophic system failure. Should the feedwater pipes for the boiler become frozen (a common occurrence during cold winter months), the system will be starved of water. If the LWCO simultaneously malfunctions, the boiler will start and run without an adequate supply of water. When the heat exchanger or boiler tubes crack or fail, the cost associated with the required labor and parts to repair the boiler (provided the parts are still available since boilers can remain in service for dozens of years) often outweigh the cost of the replacement. The failure of a relatively inexpensive component (usually between $200 and $600, plus installation) can ultimately lead to a residential settlement in excess of $10,000. Mechanical-float LWCO valves should be regularly “flushed” to remove TDSs which can prevent the float from moving freely as the water level within the boiler changes. Most manufacturers recommend flushing the boiler at least once per season (some field technical experts say as often as weekly) by opening the “blow down valve,” which sits beneath the LWCO line and allows harmful deposits to escape. Boiler feedwater should be chemically treated to prevent scaling and to maintain proper pH levels for optimal boiler efficiency and performance. The prevalence of boilers in residential and commercial heating applications makes the threat of LWCO failure real. This entry was posted in homes, robertjrussell and tagged freezing, instllation, pipes, water. Bookmark the permalink.